My family celebrates Thanksgiving one month after we migrated to the United States. My little sister celebrated her 7thÂ birthday with a party just like the ones before it. Relatives and friends packed our house, our dining table was topped with dish after dish of delicious food, and kids screamed excitedly as we played party games and hit the piÃ±ata. But as we gathered around the cake and she blew out her candles, I became aware of the one piece that was missing: my mom. 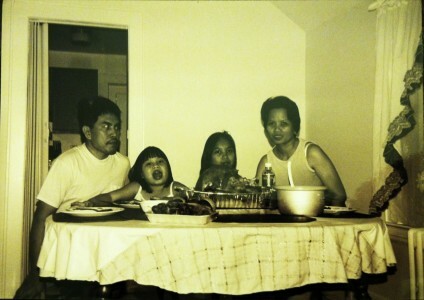 Just a few days before my sisterâ€™s birthday party, my mom left our home in the Philippines to begin our familyâ€™s new life in the United States. In a few months, the rest of my family would follow her, after sheâ€™d settled in and found a place for us to live. It was only a three-month separation, but the rift represented how much our life was about to change. It wasnâ€™t the first time my family was separated for a period of time. Even before I was born, my mother came to the United States for a few months at a time to work as a nurse. Back home, she left behind my father and my older sister, who spent her early childhood living with my grandparents, because my father worked, too. My mom also spent some time working abroad after I was born. I donâ€™t remember those days, but I remember the toys she brought home from America; my Barbie dolls, our Nintendo system and my stuffed animals. Then, after she had my little sister, she stopped going abroad to work and instead opted to stay home to raise my sisters and me. Growing up, the patchwork of knowledge I had about the United States came from my history books, television and my momâ€™s photo albums. I learned of my countryâ€™s complex relationship with Americans, dating back to World War II. I watched American artists on MTV like Britney Spears and *NSYNC. I knew Americans spoke English, like we did in school. I saw the pretty orange and yellow colors of fall in my momâ€™s photos from Boston. My parents told me shortly after my 11thÂ birthday that we were moving to the United States. I was just about to start sixth grade, and I remember being excited about going to high school the following year. (We didnâ€™t have middle school in the Philippines). But I wasnâ€™t going to finish the school year ob the same side of the world. By the time my little sisterâ€™s birthday rolled around in August, things had changed at home. My uncle and aunt were moving into our house because my older sister decided to finish college in the Philippines. She and my parents decided that she would live with my relatives while she stayed in school, and she would come visit us in America during Christmas and summer breaks. So, my aunt and uncle started moving into our apartment. They brought their aquarium with the really big fish inside, and for the first time, I wasnâ€™t excited to see their fish. It was a sad reminder that I had to say goodbye to our own pets. After all, my aunt and uncle couldnâ€™t take care of all the puppies. Packing was the most difficult. My room was a treasure trove of my childhood and I wanted to pack the whole room as it stood and bring it to our new home. I couldnâ€™t bring any of the stuffed animals Iâ€™d collected over the years or the fancy dresses from flower girl stints that I tried on to play dress up. What Iâ€™d miss the most were the people who defined my childhood. I had three best friends who lived next door. We grew up attached at the hip. Iâ€™d miss my relatives. I was always excited for the holidays, not just for the presents, but because I could see my cousins and play with them. Iâ€™d also gone to school for eight years with the same people in my classes, and I just couldnâ€™t imagine life without them. Knowing that it would be the last time Iâ€™d see a lot of these people, my sisterâ€™s party was bittersweet. I wondered how long it would be before I would see them again. I knew it was even harder on my parents. They built a family in that house, and they spent their whole lives in the Philippines. Our relatives would no longer be a few hoursâ€™ drive away. That hardship was evident two years after we moved to the United States, when my dadâ€™s mother passed away. Itâ€™s hard enough to lose a parent, but itâ€™s even harder not to be able to say goodbye from halfway around the world. Itâ€™s now ten years after we moved. Iâ€™ve yet to go back to the Philippines, and I havenâ€™t seen any of my friends or relatives, apart from a cousin who came to the United States last year. Most of my friends from school have graduated from college. The three girls who lived next door all moved to Canada. Iâ€™ve connected with a lot of them through Facebook, and every now and then we reminisce. Itâ€™ll have to do.